The Clinton Township Police Department said it has arrested a man who allegedly targeted elderly people for robberies at several locations over the weekend. According to police, a 79-year-old Macomb Township man was at Walmart on Hall Rd. and I-94 on Friday afternoon when he was approached by the suspect, who asked him how to get to Gratiot Ave. The 79-year-old man told the suspect he would show him, so the suspect followed the victim. At Gratiot and Maplehurst, the suspect stopped his car in front of the victim, got out and approached his car, implied he had a gun and reached inside the vehicle, stealing the 79-year-old man's wallet. 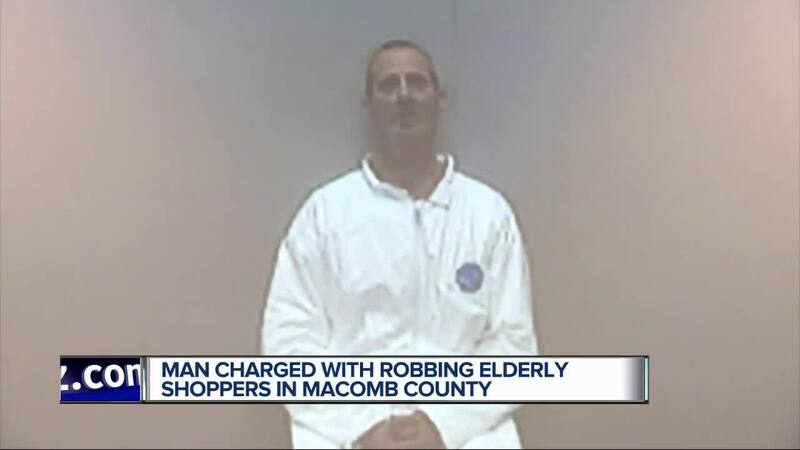 CLINTON TOWNSHIP, Mich. (WXYZ) — The Clinton Township Police Department said it has arrested a man who allegedly targeted elderly people for robberies at several locations over the weekend. According to police, a 79-year-old Macomb Township man was at Walmart on Hall Rd. and I-94 on Friday afternoon when he was approached by the suspect, who asked him how to get to Gratiot Ave. The 79-year-old man told the suspect he would show him, so the suspect followed the victim. At Gratiot and Maplehurst, the suspect stopped his car in front of the victim, got out and approached his car, implied he had a gun and reached inside the vehicle, stealing the 79-year-old man's wallet. Two days later on Sunday morning, an 87-year-old Clinton Township woman was loading groceries into her car at the same Walmart. The suspect then pushed the woman into her car and stole her purse, which was on the seat. The suspect, identified as 51-year-old Robert Montroy, from Hamtramck, fled the scene. He was stopped by a Macomb County Sheriff's deputy at I-94 and Hall Rd. and arrested. According to Clinton Township police, they recovered evidence from two other recent robberies in Chesterfield Township in the vehicle. On Tuesday, the Macomb County Prosecutor charged Montroy with armed robbery, unarmed robbery and receiving and concealing stolen property. He will be arraigned on Tuesday afternoon.